Clamp on lights or desk lamps with bendable arms will cost you no more then $20 each, but you’ll have to use a tripod because they give out a much weaker light compared to strobes. A steady tripod is important, and even with that you can create camera shake just by clicking your shutter. If you have a “mirror lock up” on your camera, use it. If you don’t (point and shoot cameras don’t) you don’t have to worry, just be careful when you click the shutter not to jar the camera. I would buy at least 3 or 4 because I would adapt them for different light sources. With one, I would simulate a soft box by covering the light with some white semi-transparent material, like white parchment paper. Poke several holes to vent out the heat of the bulb—we don’t want to start a fire. For another, try attaching black boards to either side to simulate “Barn Doors” (that’s what we call the lights that have movable flaps so you can narrow the angle of flare), duck tape goes a long way. Close them almost completely and you have what looks like light coming through a blind in the window. Use it as a back light just when you want the light to skim the surface (see previous juicy onion post). This will be a difficult one to make work, but anything you can rig up to control the light can be very useful, even just cutting out different sized holes in black cardboard to place in front of the light to make different size spot lights. And try making a lot of dime sized holes in one board to simulate a “grid spot” that creates a soft round spot light. These are all great for back lighting your subjects. The last light I would leave alone. 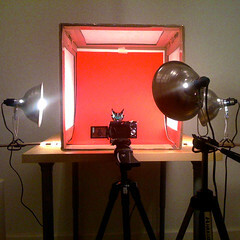 With this one you can either point it straight up at the ceiling, if it’s a light color, and the light will bounce off making soft over head light—or, point it at a white card to the side of your subject and the light will bounce from the white board onto the subject creating a soft side light. Pieces of foam core that you can get at any art or office supply store are perfect and don’t need to be larger than 16X20 if you’re doing food. You won’t have to use all of these at the same time. Play with one or two add more if you need it. Most importantly, have fun and good luck. Getting good lighting is certainly the biggest challenge I've faced as I've gotten more and more into food photography as a hobby. The flash on any of your average point and shoot cameras (like my Canon PowerShot) is absolutely terrible... and making sure to turn that off when I take pictures has made a nice positive impact in my photos... but of course, it's not like the flash is wrong when it claims there is insufficient light... so just turning off your flash in bad lighting doesn't exactly solve all your problems. What I end up doing is taking my poorly lit photographs and doctoring them in Picasa... I mess with the contrast, sometimes the color, and sometimes the fill light to try and get end results that look decent, with varying degrees of success. While I won't be challenging Donna or smitten kitchen for "best food photo" anytime soon, I've at least made some progress since last year. I have thought of doing something like Donna suggests... that is, buying cheap lamps that I could keep in my closet until I needed them for food photos... the limited storage space of a Cambridge apartment, however, has made me a little hesitant to go that route. Indeed, while I've decided that I like taking pictures of food I make enough to get an entry level DSLR... what I'm going to do about lighting remains unresolved. I had been planning on following smitten kitchen's advice, and adding a high end flash somewhere down the road (along with a little tripod and remote switch)... but one thing that sets Donna Ruhlman's photos apart from many food bloggers, is her use of light... and that's not achievable by just buying a fancy flash. Do I care about that? Well, not at the moment... I'd just like to be able to take pictures of food at night that are adequately lit... not necessarily expertly lit. Baby steps, I guess... probably should make sure I can effectively use a DSLR before going too crazy... but it does seem that getting a tripod, remote switch, and a couple of lamps would be far cheaper than a fancy flash and maybe even give me a little more room to grow as far as using light. I'm not getting a fancy flash any time soon, so that may be what I ultimately do.